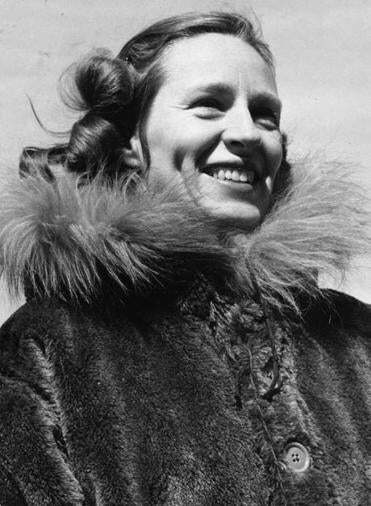 Barbara Polk Washburn had a simple training regimen before becoming the first woman to climb Mount McKinley, considered among the most difficult mountaineering challenges in the Western Hemisphere. The 70-day, 14,600-foot climb from base camp in 1947 was the last of a series of mountaineering firsts for the mother of three. But her adventures continued for decades more as she helped her husband, famed mountaineer and photographer Bradford Washburn, transform Boston’s Museum of Science into a world-class institution and create a series of definitive topographical maps of far-flung corners of the globe. Mrs. Washburn, who never so much as camped before marrying Bradford Washburn, died Thursday in her home in Brookhaven at Lexington. She would have turned 100 on Nov. 10. Mrs. Washburn, who climbed mountains and helped transform Boston’s Museum of Science, died Sept. 25. Her partnership with her husband traversing the pinnacles and trenches of the Earth nearly never got off the ground. “Oh, phooey ... he must be a nut,” she said, recalling her first reaction before meeting him in 1939, shortly after graduating from Smith College. An acquaintance had suggested she apply for a job to be Washburn’s personal secretary after he took control of the museum. Back then, the institution was little more than a collection of dusty animal specimens in the Back Bay. Even after a job interview with Washburn, she was convinced her future lay elsewhere. Yet Washburn’s trademark persistence — he called her every day for about two weeks after the interview in an attempt to persuade her to join the museum staff — paid off. Almost a year later, he asked her, shortly after their first date to marry him. “I didn’t ask him if he ever wanted me to climb mountains, and he never asked me if I was afraid of heights,’’ she said in the audio history. They married in 1940. It turns out, the newlywed bride quickly learned, he did want her to climb mountains. Within a month of exchanging vows, they were poring over maps and photos and planning the first recorded ascent of Mount Bertha, a 10,000-foot mountain near the Alaskan coast. Afternoons were spent experimenting in the kitchen with different freeze-dried foods. “The neighbors began complaining about terrible odors coming through the vents into their apartments,’’ she wrote in her memoir. She proved to be a quick learner, mastering everything from mushing a dog sled across a glacier to making coffee from melted snow. Even in the upper altitudes of Earth, however, Mrs. Washburn found herself tethered to the attitudes of the era. “She told me that on the expeditions ‘I never forgot my lipstick or my apron. I am a product of my time,’ ’’ said Tony Decaneas, a partner with Bradford Washburn in the production and publication of his photography. The final summit push and descent took 19 straight hours on the trail. The following summer, the new parents led the first recorded ascent of Mount Hayes. At more than 13,700 feet, and with an intimidating final ridge to the summit, the mountain was much more challenging than Bertha. At one part of the ascent, Mrs. Washburn led the party, tethered together with ropes, on a knife-edged part of the ridge at 12,000 feet. The rationale: If one of the cornices — massive snow drifts that extend out from the ridge — gave way as she walked, she should be light enough to haul back from the abyss. She summited in a boy’s parka. Adequate winter gear for women was not yet available. Mrs. Washburn hung up her crampons for the next several years, raising three children. She leaves two daughters, Dorothy Dundas of Newton and Elizabeth Cabot of Belmont, a son, Edward of Lexington, nine grandchildren, and seven great-grandchildren. Bradford Washburn died in 2007. Services for Mrs. Washburn are private. The McKinley expedition stemmed from a request by RKO Radio Pictures, which sought to shoot a documentary on mountain climbing. While Bradford Washburn was considered the preeminent climber on the continent and would be the first to summit McKinley twice if the expedition succeeded, many at RKO were equally intrigued by the novelty of a woman, Mrs. Washburn, conquering what was then considered both a man’s and a natural world. In the first half of the 20th century, Mount McKinley had held an Everest-like fascination among the premier American mountaineers, all of whom were men. “There were not very many women climbing any mountains. Period,’’ Freedman said. Mrs. Washburn initially refused entreaties from her husband and the production team. She insisted on staying with her children. After RKO promised to pay for a nurse for the Washburn children for the three-month trip, she relented. Writing in her diary, Mrs. Washburn said the decision to leave behind the family was probably the hardest of her life. Although supplies and support were first-rate, the expedition was arduous. From plateau to summit, the rise up McKinley exceeds that of Mount Everest by 6,000 feet. And because it is so close to the Earth’s pole, the chances of altitude sickness and harsh weather are extremely high. The first night at the first base camp provided the first hint: Temperatures of 30 degrees below kept a fitful and sleepless Mrs. Washburn thinking she might had made a mistake by joining the group. She struggled to persevere through pounding headaches from altitude sickness, a fire that erupted in her tent, and a pummeling blizzard that separated her from her husband and pinned her and two others to a ridge at 14,600 feet for nine days. By the time June 6 dawned sunny with relatively mild temperatures of 20 below, she had regained much of their strength and spirit. As the expedition neared the summit, the leader of the line deferred to Mrs. Washburn, telling her she should lead since she would be the first woman on the tallest mountain in North America. Over the next decades as they raised their family, she and her husband spent the summer months making definitive topographical maps of the Grand Canyon, Mount McKinley, and the White Mountains of New Hampshire. The work was extensive and exhaustive — including 697 helicopter landings, some on precarious perches, in the Grand Canyon, temperatures ranging from 137 degrees to 15 below, and hikes through hundreds of miles of trails. They were also part of a team that mapped Mount Everest. During the winters, Mrs. Washburn was a reading specialist at Shady Hill School in Cambridge, where she was an early and ardent proponent of special programs to help students with learning disabilities. She treasured letters of thanks, sent by former students years later, as among her greatest honors, which included the Centennial Award from the National Geographic Society in 1988. At that ceremony, she was seated among such other honorees as Edmund Hillary, Jacques Cousteau, and John Glenn and discussed her treks to the Earth’s ceilings.